This article is about Gerasa in Jordan. For Gerasa in Judea, see Gerasa (Judaea). Not to be confused with Jarash, Jerusalem. Jerash (Arabic: جرش‎, Ancient Greek: Γέρασα) is the capital and the largest city of Jerash Governorate, Jordan, with a population of 50,745 as of 2015. 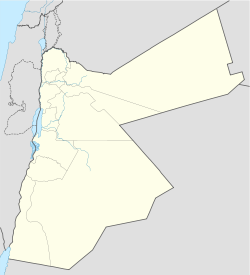 It is located 48 kilometres (30 mi) north of the capital of Jordan, Amman. The Roman city of Gerasa and the modern Jerash (in the background). The history of the city is a blend of the Greco-Roman world of the Mediterranean Basin and the ancient traditions of the Arab Orient. The name of the city reflects this interaction. The earliest Arab/Semitic inhabitants, who lived in the area during the pre-classical period of the 1st millennium BCE, named their village Garshu. The Romans later Hellenized the former name of Garshu into Gerasa. Later, the name transformed into the Arabic Jerash. The city flourished until the mid-eighth century CE, when the 749 Galilee earthquake destroyed large parts of it, while subsequent earthquakes (847 Damascus earthquake) contributed to additional destruction. However, In the early 12th century, by the year 1120, Zahir ad-Din Toghtekin, atabeg of Damascus ordered a garrison of forty men stationed in Jerash to convert the Temple of Artemis into a fortress. It was captured in 1121 by Baldwin II, King of Jerusalem, and utterly destroyed. Then, the Crusaders immediately abandoned Jerash and withdrew to Sakib (Seecip); the eastern border of the settlement. Jerash was then deserted until it reappeared by the beginning of the Ottoman rule in the early 16th century. In the census of 1596, it had a population of 12 Muslim households. However, the archaeologists have found a small Mamluk hamlet in the Northwest Quarter which indicates that Jerash was resettled before the Ottoman era. The excavations conducted since 2011 have shed light on the Middle Islamic period as recent discoveries have uncovered a large concentration of Middle Islamic/Mamluk structures and pottery. In 1806, the German traveler Ulrich Jasper Seetzen came across and wrote about the ruins he recognized. The ancient city has been gradually revealed through a series of excavations which commenced in 1925, and continue to this day. Archaeologists have found ruins of settlements dating back to the Neolithic Age. Moreover, in August 2015, an archaeological excavation team from the University of Jordan unearthed two human skulls that date back to the Neolithic period (7500–5500 BC) at a site in Jerash, which forms solid evidence of inhabitance of Jordan in that period especially with the existence of 'Ain Ghazal Neolithic settlement in Amman. The importance of the discovery lies in the rarity of the skulls, as archaeologists estimate that a maximum of 12 sites across the world contain similar human remains. Evidence of settlements dating to the Bronze Age (3200 BC – 1200 BC) have been found in the region. Jerash is the site of the ruins of the Greco-Roman city of Gerasa, also referred to as Antioch on the Golden River. Ancient Greek inscriptions from the city support that the city was founded by Alexander the Great and his general Perdiccas, who allegedly settled aged Macedonian soldiers there during the spring of 331 BC, when he left Egypt and crossed Syria en route to Mesopotamia. However, other sources, namely the city's former name of "Antioch on the Chrysorrhoas, point to a founding by Seleucid King Antioch IV, while still others attribute the founding to Ptolemy II of Egypt. 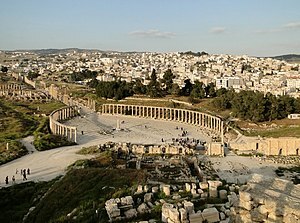 After the Roman conquest in 63 BC, Jerash and the land surrounding it were annexed to the Roman province of Syria, and later joined the Decapolis league of cities. The historian Josephus mentions the city as being principally inhabited by Syrians, and also having a small Jewish community. In AD 106, Jerash was absorbed into the Roman province of Arabia, which included the city of Philadelphia (modern day Amman). The Romans ensured security and peace in this area, which enabled its people to devote their efforts and time to economic development and encouraged civic building activity. Jerash is considered one of the largest and most well-preserved sites of Roman architecture in the world outside Italy. And is sometimes misleadingly referred to as the "Pompeii of the Middle East" or of Asia, referring to its size, extent of excavation and level of preservation. Jerash was the birthplace of the mathematician Nicomachus of Gerasa (Greek: Νικόμαχος) (c. 60 – c. 120 AD). In the second half of the 1st century AD, the city of Jerash achieved great prosperity. In AD 106, the Emperor Trajan constructed roads throughout the province, and more trade came to Jerash. The Emperor Hadrian visited Jerash in AD 129–130. The triumphal arch (or Arch of Hadrian) was built to celebrate his visit. The city finally reached a size of about 800,000 square meters within its walls. The Persian invasion in AD 614 caused the rapid decline of Jerash. Beneath the foundations of a Byzantine church that was built in Jerash in AD 530 there was discovered a mosaic floor with ancient Greek and Hebrew-Aramaic inscriptions. The presence of the Hebrew-Aramaic script has led scholars to think that the place was formerly a synagogue, before being converted into a church. The city flourished during the Umayyad Caliphate. It had numerous shops and issued coins with the mint named "Jerash" in Arabic. It was also a center for ceramic manufacture; moulded ceramic lamps had Arabic inscriptions that showed the potter's name and Jerash as the place of manufacture. The large mosque and several churches that continued to be used as places of worship, indicated that during the Umayyad period Jerash had a sizable Muslim community that co-existed with the Christians. In CE 749, a devastating earthquake destroyed much of Jerash and its surroundings. In the early 12th century the Temple of Artemis was converted into a fortress by a garrison stationed in the area by the Zahir ad-Din Toghtekin, atabeg of Damascus. Baldwin II, King of Jerusalem, captured and burned the fortress in CE 1121–1122. The inner faces of the temple walls still clearly show the effect of the great fire. Small settlements continued in Jerash during the Mamluk Sultanate, and Ottoman periods. This occurred particularly in the Northwest Quarter and around the Temple of Zeus, where several Middle Islamic/Mamluk domestic structures have now been excavated. Jerash has a hot-summer Mediterranean climate (Köppen climate classification Csa). Excavation and restoration of Jerash has been almost continuous since the 1920s. Most of these monuments were built by donations of the city's wealthy citizens. The south theatre has a focus in the centre of the pit in front of the stage, marked by a distinct stone, and from which normal speaking can be heard easily throughout the auditorium. From AD 350, a large Christian community lived in Jerash, and between AD 400–600, more than thirteen churches were built, many with superb mosaic floors. A cathedral was built in the 4th century. An ancient synagogue with detailed mosaics, including the story of Noah, was found beneath a church. The use of water power to saw wood or stone is well known in the Greek and Roman world, the invention in Greece occurring in the 3rd century BC. They converted rotary movement from the mill to linear motion using a crankshaft and good examples are known from Hierapolis and Ephesus to the north. The mill is well described in the visitors centre, and is situated near the Temple of Artemis. In 2018, at least 14 sculptures were discovered in Gerasa, including images of Aphrodite and Zeus. A sidewalk at the downtown. The Arch of Hadrian was built to honour the visit of Emperor Hadrian to Gerasa in 129/130 AD. Jerash has developed dramatically in the last century with the growing importance of the tourism industry in the city. Jerash is now the second-most popular tourist attraction in Jordan, closely behind the ruins of Petra. On the western side of the city, which contained most of the representative buildings, the ruins have been carefully preserved and spared from encroachment, with the modern city sprawling to the east of the river which once divided ancient Jerash in two. Recently the city of Jerash has expanded to include many of the surrounding areas. Jerash has an ethnically diverse population. The vast majority are Arabs, though the population includes small numbers of Kurds, Circassians and Armenians. A majority is Muslim. According to the Jordan national census of 2004, the population of the city was 31,650 and was ranked as the 14th largest municipality in Jordan. According to the last national census in 2015, the population of the city was 50,745, while the population of the governorate was 237,059. Jerash became a destination for many successive waves of foreign migrants. In 1885, the Ottoman authorities directed the Circassian immigrants who were mainly of peasant stock to settle in Jerash, and distributed arable land among them. The new immigrants have been welcomed by the local people. Later, Jerash also witnessed waves of Palestinian refugees who flowed to the region in 1948 and 1967. The Palestinian refugees settled in two camps; Souf camp near the town of Souf and Gaza (Jerash) camp at Al Ḩaddādah village. Since 1981, the old city of Jerash has hosted the Jerash Festival of Culture and Arts, a three-week-long summer program of dance, music, and theatrical performances. The festival is frequently attended by members of the royal family of Jordan and is hailed as one of the largest cultural activities in the region. In addition performances of the Roman Army and Chariot Experience (RACE) were started at the hippodrome in Jerash. The show runs twice daily, at 11 am and at 2 pm, and at 10 am on Fridays, except Tuesdays. It features forty-five legionaries in full armour in a display of Roman army drill and battle tactics, ten gladiators fighting "to the death" and several Roman chariots competing in a classical seven-lap race around the ancient hippodrome. Jerash's economy largely depends on commerce and tourism. Jerash is also a main source of the highly educated and skilled workforce in Jordan. The location of the city, being just half an hour ride from the largest three cities in Jordan (Amman, Zarqa and Irbid), makes Jerash a good business location. Jerash has two universities: Jerash Private University and Philadelphia University. The number of tourists who visited the ancient city of Jerash reached 214,000 during 2005. The number of non-Jordanian tourists was 182,000 last year, and the sum of entry charges reached JD900,000. The Jerash Festival of Culture and Arts is an annual celebration of Arabic and international culture during the summer months. Jerash is located 48 km north of the capital city of Amman. The festival site is located within the ancient ruins of Jerash, some of which date to the Roman age (63 BC). Jerash Festival is a festival which features poetry recitals, theatrical performances, concerts and other forms of art. In 2008, authorities launched Jordan Festival, a nationwide theme-oriented event under which Jerash Festival became a component. However the government revived the Jerash Festival as the "substitute (Jordan Festival) proved to be not up to the message intended from the festival." ^ a b "Jordan: Governorates, Major Cities & Urban Localities - Population Statistics, Maps, Charts, Weather and Web Information". www.citypopulation.de. Retrieved 30 May 2018. ^ a b Bell, Brian (1994). Jordan. APA Publications (HK) Limited. p. 184. ^ McEvedy, Colin (2011). Cities of the Classical World: An Atlas and Gazetteer of 120 Centres of Ancient Civilization. UK: Penguin. ISBN 0141967633. ^ Boulanger, Robert (1965). The Middle East: Lebanon, Syria, Jordan, Iraq, Iran. Paris: Hachette. pp. 541, 542. ^ Heath, Ian (1980). A wargamers' guide to the Crusades. p. 133. ^ Brooker, Colin H.; Knauf, Ernst Axel (1988). "Review of Crusader Institutions". Zeitschrift des Deutschen Palästina-Vereins (1953–). 104: 187. JSTOR 27931345. ^ Schryver, James G (2010). Studies in the archaeology of the medieval Mediterranean. Leiden [Netherlands]; Boston: Brill. pp. 86. ISBN 9789004181755. ^ Hütteroth, Wolf Dieter; Abdulfattah, Kamal (1977). Historical geography of Palestine, Transjordan and Southern Syria in the late 16th [sixteenth] century. Fränkische Geographische Ges. p. 164. ISBN 9783920405414. ^ "Archaeologists studying a post-quake gap in Jerash history". Jordan Times. 7 April 2016. Retrieved 2017-06-07. ^ Peterson, Alex. "Medieval Pottery from Jerash: The Middle Islamic Settlement". Gerasa/Jerash: From the Urban Periphery. ^ a b "Touristic Sites – Jerash". www.kinghussein.gov.jo. ^ "Two human skulls dating back to Neolithic period unearthed in Jerash". 15 August 2015. Retrieved 24 November 2016. ^ McGovern, Patrick E.; Brown, Robin (1986). Late Bronze & Early Iron Ages of Central. UPenn Museum of Archaeology. p. 6. ISBN 978-0-934718-75-2. ^ Nigro, Lorenzo (2008). An Early Bronze Age Fortified Town in North-Central Jordan. Preliminary Report of the First Season of Excavations (2005). Lorenzo Nigro. p. 52. ISBN 978-88-88438-05-4. ^ Steiner, Margreet L.; Killebrew, Ann E. (2014). "Main Settlements of the North Jordan Uplands". The Oxford Handbook of the Archaeology of the Levant: c. 8000–332 BCE. OUP Oxford. ISBN 978-0-19-166255-3. ^ a b c "Jerash - A Brief History". المشرق. Retrieved 7 March 2018. ^ Josephus, De Bello Judaico (Wars of the Jews) II, 457 (Wars of the Jews 2.18.1) and De Bello Judaico (Wars of the Jews) II, 477 (Wars of the Jews 2.18.5. ^ Borgia, E. (2002). Jordan: Past and Present: Petra, Jerash, Amman. Oxford: Oxford University Press. ^ Taran, L. (1970). "Nicomachus of Gerasa". In Gillispie, Charles C. Dictionary of Scientific Biography (1st ed.). New York: Charles Scribner's Sons. ^ Bryce, Trevor (2016). Atlas of the Ancient Near East: From Prehistoric Times to the Roman Imperial Period. Abingdon: Routledge. ISBN 9781317562092. ^ Bisheh, Ghazi (2017). "Jarash (Gerasa) in Discover Islamic Art, Museum With No Frontiers, 2017". www.discoverislamicart.org. ^ "CLIMATE: Jerash". Climate-Data. Retrieved 2017-07-19. ^ "Roman Statues Unearthed in Jordan". Archaeology. 4 October 2018. ^ "Jerash". Visit Jordan. Jordan Tourism Board. Retrieved 7 March 2018. ^ "Jerash Refugee Camp" (in Arabic). UNRWA. Retrieved 7 March 2018. ^ "Souf Refugee Camp" (in Arabic). UNRWA. Retrieved 7 March 2018. ^ "Jerash Private University". Retrieved 24 November 2016. ^ Schneider, I., & SoKnmez, S. (1999). Exploring the touristic image of jordan. Tourism Management, 20, 539–542. ^ "صحفي - Jerash Festival slated to open July 20". sahafi.jo. Retrieved 2018-05-25. Wikimedia Commons has media related to Jerash. Wikivoyage has a travel guide for Jerash.